Increase your success with your learners, family or co-workers. Learn to teach effectively and efficiently with fun for you and your learners. Learn how to get more of the behavior you want. 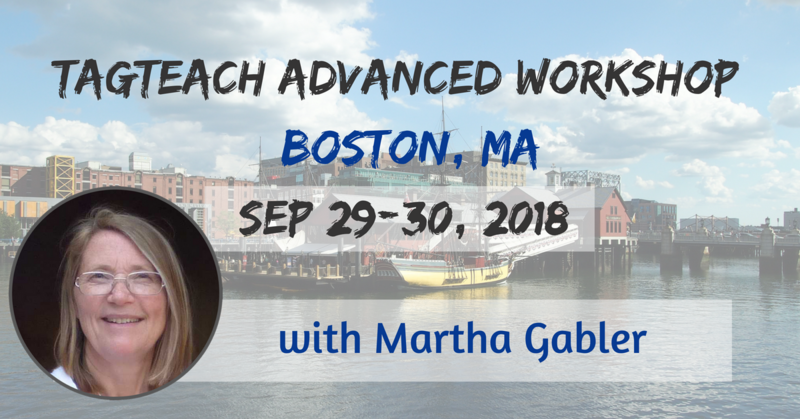 Take your TAGteach skills to the next level in this high intensity, hands-on workshop with TAGteach faculty member Martha Gabler. You should come if you're a parent, teacher, parent of a special needs child, dog trainer, guide dog mobility instructor, sports coach or ABA therapist. If you need to teach skills (social, physical, academic or life skills), to children or adults then this workshop is for you. You'll gain valuable insight into how to tailor your teaching to your specific learner, how to break your teaching down into manageable pieces, how to reinforce effectively and how to apply more advanced TAGteach tools to take your teaching to the next level. CCPDT, IAABC, KPA - 16 credits! TAGteachers, you'll get the discount automatically if you use the same email as you use to login to the membership system and your membership is up to date. Students, teachers of the visually impaired and Special Olympics coaches, please provide proof of your status and send to joan@tagteach.com for the discount code. We'll have more info for you as the time gets closer.